Creation legends from countless peoples and cultures tell of a time when the world was sung into existence. The New Testament tells us “In the beginning was the Word.” The Mino People of China tell of Heavenly King clapping his hand to create Earth and Heaven. The Miwok, Apache, Pima, and Hopi peoples, all tell of the Earth being sung into existence. The ancient Mesopotamians and Babylonians believed that even the gods, themselves, were called into being. Dozens of other cultures have similar ancient beliefs, that the Universe and the planet upon which we live, were created by sound. 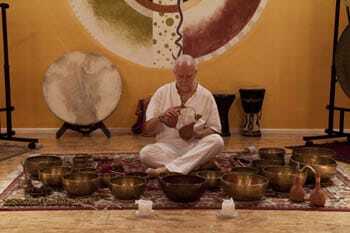 Shamanic sound healing is based on the shamanic principle that If sound and vibration can create, they can heal. From the dawn of human existence to the present time, shamans the world over, have used sound for creation and healing. Using drums, rattles, and/or medicinal plants, the shaman enters into a state of non-ordinary reality. In this state the shaman can journey deep into the underworld in search of a song to heal his community, or save a life. Every body has it's natural harmonic resonance. When this resonance is disrupted, disease and dis-ease can result. Musical instruments such as; flutes, drums, gongs, and singing bowls can be used to create an harmonic field that can restore the body's natural vibratory resonance and restore the body to vibrant natural health. Now, 21st Century medical science is beginning to catch on. High tech ultrasound machines, treat tumors and cataracts, smash kidney stones, and destroy cancers. Medical imaging equipment, use high frequency ultrasound to view soft tissue, and keep track of fetal development. Sound, the power to create and the power to heal. and they danced and they sang until the earth was created."